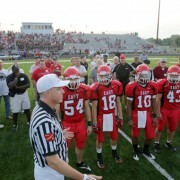 Two weeks ago, Des Moines East was sitting at 1-2 in their district and facing a crucial game against Ames. In a blink of an eye, there was no game. A false internet threat of violence at East set off a wild chain of events that resulted in Ames backing out of playing at East and the Scarlets being forced to forfeit. 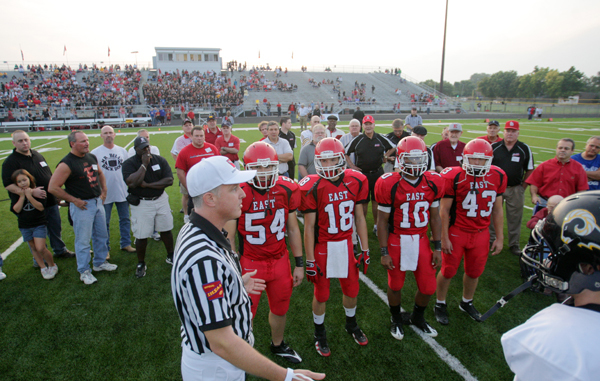 After several days of outrage and bewilderment, the forfeit was changed to a “no contest”, which meant the game didn’t count on East’s record. The events gave East (4-4) a chance to reset and control their own destiny towards the playoffs. After a resounding win over Sioux City North, what was once a lost opportunity now became a reality for Coach Greg Schoon’s bunch: a playoff run. The old saying goes, to be the best you have to beat the best. The Scarlets will get that chance as they drew #4-ranked West Des Moines Valley in a Class 4A 1st round game Wednesday night at Valley Stadium. 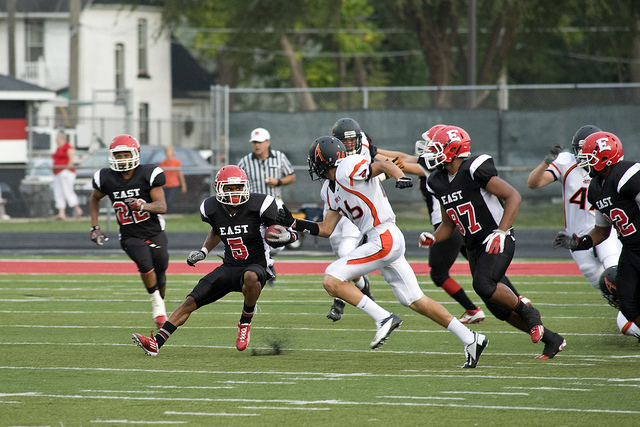 East racked up 581 total yards, 472 on the ground in their 62-35 thumping of S.C. North. Quarterback Chino Alcala rushed for 250 yards and passed for 109, while running back Brandon Trotter racked up 233 yards against the Stars’ defense. Alcala’s go-to receivers have been Josh Davis and Jaylin James, who have combined for a little over 850 receiving yards and 50 receptions between them. Lead by linebackers Rory Walling and Juleo Harris, East High’s defense leads Class 4A in takeaways. Walling, a sophomore, has been nothing short but impressive in the defensive lineup. 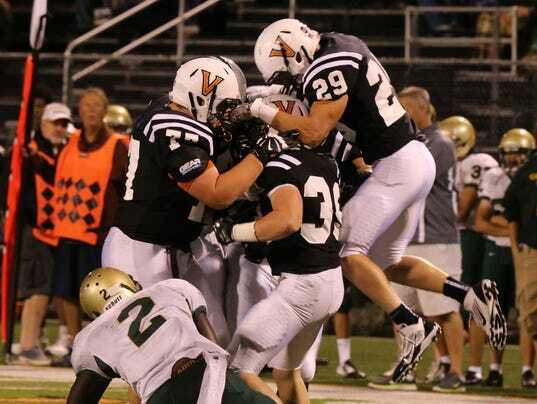 The Valley Tigers (8-1) dominated Des Moines Lincoln, 62-0, in their regular season finale. Everyone knows about the usual suspects of (Rocky) Lombardi, (Dominique) Dafney, and (Drew) Gray, but Mr. Versatility, Blake Salsbury, is called upon to contribute in any way for Gary Swenson’s Tigers. He scored both a running and receiving TD against the Rails on Friday, from his fullback position. Gray broke the 1,000 yard rushing barrier by picking up 147 yards on the ground and two touchdowns against the Railsplitters (3-6). Dafney had another stellar performance, hauling in 6 catches for 160 yards and two touchdowns. Will East find a way to chip away at Valley and put a monkey wrench into the Tigers’ pursuit of a state title, or will Valley send the Scarlets packing for the winter? The Facts: East defeated SC North 62-37 and finished 2-2 for 4th place in Class 4A District 1. Valley cruised to a 62-0 win over DM Lincoln, completing an 8-1 season and a 4A District 4 title and plus have won 8 straight. The last time the Scarlets and the Tigers met, ironically, was a first-round playoff game on November 3, 2004. Valley eliminated East 49-14, en route to a runner-up finish for the 4A state title (losing to Bettendorf 34-22). Will there be enough East athleticism to score a program-defining win? Can East’s defense force Valley’s offense to turn the ball over? Will a rested and healthy Valley be primed for a run towards the UNI-Dome? 8 straight wins for Valley, will 9 be fine for the Tigers behind a stingy D? Offensive starters – QB Chino Alcala; RB Brandon Trotter; WR Quincy Green, Juleo Harris, Gerald Sama, and Hunter Kahler; C Tim Carney, G Case Tillotson and David Razo, T Billy White and Zach Stemsrud. 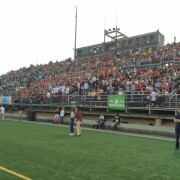 Our live pregame show on the Central Iowa Sports Network (centraliowasportsnetwork.com) will begin at 6:50 pm, with kickoff at 7 pm. The game will be live streamed audio only. Join Paul Yeager, Dar Danielson, and Keith Borness for the play-by-play, with Jim Kirby on the field with the Scheels sideline report. 2013 was a sub-par year for Coach Greg Schoon and the East Scarlets, but it wasn’t due to a lack of effort. Injuries and turnovers during crucial moments in games were their undoing in several close games. Schoon is excited about this year’s squad that will consist of new junior and senior starters to complement senior QB Chino Alcala, WR Jason Jeffries on offense, and a trio of senior LBs lead by senior Alex Contreras on defense. Interesting stories about the squad, players, or upcoming season: The Scarlets’ strength is overall team athleticism in all positions. Schoon is excited about the improvements on the freshmen and sophomore/JV level. The biggest challenge is filling in new starters at key position, especially on the defensive and offensive side of the line. Inexperience is always a potential problem, Schoon cited, but he is excited about this year’s team and looking forward to help them excel.